Discussion Critique My Swing As I Need Help! Critique My Swing As I Need Help! I have been lurking the instructional pages the last few days and noticed that many members give good tips. I am hoping some of you will be able to send me a few tips to try out based on my swing (I have thick skin). I seem to lack distance and would love to be able to pick some up. I do not have a book handicap but my average over the last 18 rounds is 79. I do not make many birdies but I do keep it in play and have a decent short game. The strength of my game used to be accuracy off the tee, but the last few rounds not so much. I did hit it pretty accurate the day these videos were taken though. I have always been a handsy/feel type of player and have never had a lesson. My driver misses are most always left and my iron misses are usually hit fat. Anyone have any tips based off of my swing that they care to share? I would love to increase ball speed with the driver as I am in the 138-140 range now but I am open to any kind of tips or drills. I think it is about time to bring a little of the technical side of golf to my game. Current driver distance about 245 yards. Camera angle isn’t good enough to see a whole lot, but arms are trailing the body on the downswing. First step would be to decrease arm swing in the backswing. Might be an issue causing that, but hard to say with these camera angles. An earlier wrist set would help. 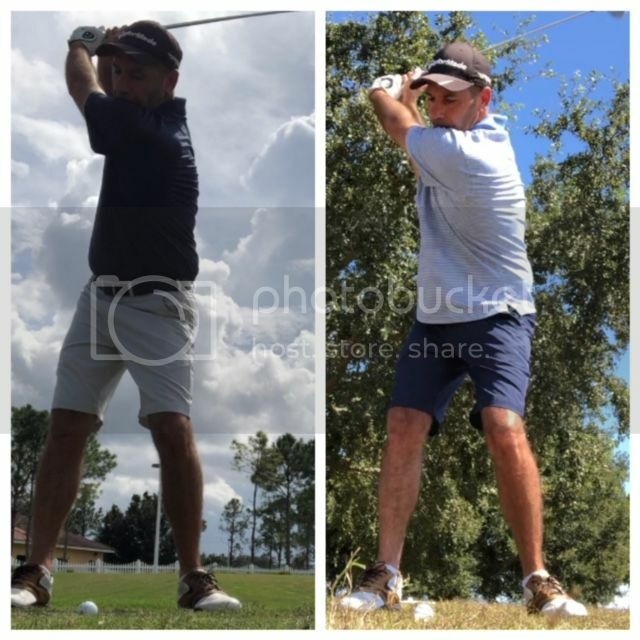 Here are two pictures...backswing and downswing. 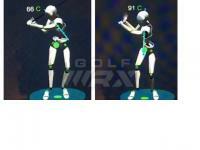 More wrist set on the backswing might reduce your backswing length and result in more retained set on the downswing. Ball position is too,far back. Thank you Monte. I will try to decrease the backswing and see if that helps. I will also try for a better camera angle. I think it may be the camera angle as it was in front of me a little bit. Hopefully I can get a better angle next trip out. 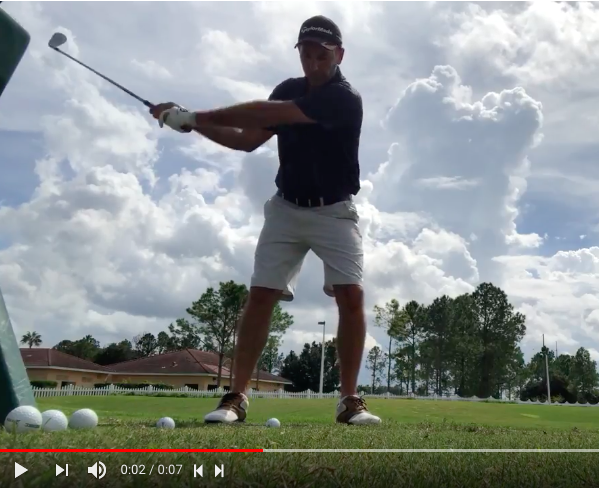 Take the club back low and slow to help with your arm/body timing on the rotation. You've picked the club up too quickly and the face angle suffers as a result. Thank you Theinfidel. I just looked back at the video and you are correct, my first move looks to be lifting grip towards the sky. Will try and get rid of that with the low and slow. Great eye and tip! I made it back to the range today to try and shorten up my backswing and try and get some better angles on video. I tried like ****, but now that I am looking at the videos, it does not look like I shortened it too much. I also tried to add more hinge, that did not seem to go so well either. I did hit the ball good though. I did not try and shorten it with the driver, should I? Any drills that have worked well for anybody to help keep the arms from trailing the body? Today is on the right. Was trying to get more wrist set. Try to shorten backswing. Today on right. You will not see significant visual changes for weeks and months. Intending to shorten arm swing and better hinge had some positive affects. 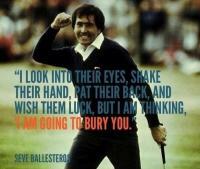 This is a big reason golfers dont improve. 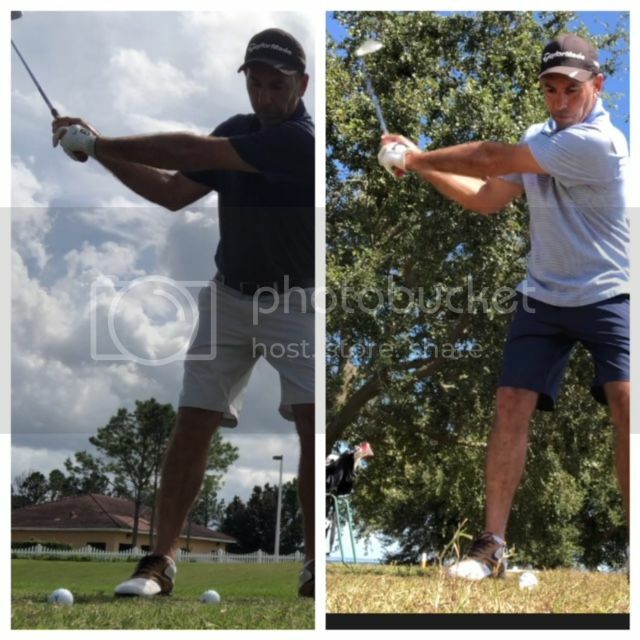 They go to the range 1/2 times with swing improvement plans, they see no change and give up. Same reasons diets and workout regimens fail. 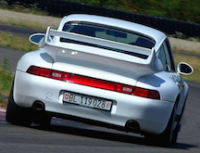 It takes time to reprogram and ingrained motor function. Great advice Monte (as always). Like a diet, it is a lifestyle change. If you do not make it the new norm, it will go back to what is was before any change was made. I did see minor improvement after looking at the videos and pics, hopefully it will sink in more and more with continuing reps. The good thing is that I hit the ball good. That makes it much easier to stay with it. That may not be significant improvement visually, but for one range session it’s huge. Thank you for the encouragement, it is much needed mentally. I have been struggling with keeping my spine angle since a shoulder injury kept me away from the game for a few years. Although it still looks like it needs work, I have seen a big improvement the last 6 months. I have also picked up a few tips for it in other posts I have seen in this site. It looks like you’re heading in the right direction. I used to have a long swing as well. Try to feel like you get more of your swing from that wrist set instead of just arms like others have said. One thing that helped me shorten my swing was taking a lot of 3/4 shots and trying to stop the backswing when my arm was parallel to the ground. It won’t actually stop there, but what feels like a 3/4 swing to you will probably be the right amount of backswing. Keep working at it. Thanks for the tip and encouragement Mosh. Lol, the pic in right was my 3/4, at least it felt like it. Funny how the camera does not lie. The 3/4 thinking is going to be my only swing though the next few range trips, hopefully I will see more improvement after a few more trips. One tip I saw for shortening the swing was to not let the hands get above the head. The pro who did this hardly lost any distance as well. The hands will get higher in practice but it's a good intent. it took me 1600 drills to improve wrist **** to the point it felt normal. You have to persist with it and slo mo practice without hitting a ball helps. The other thing I found helped me was to identify what you currently do (x) and what you want to do (y) and say to yourself - instead of x do y. 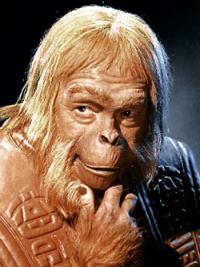 Then it's almost like watching yourself outside your body and checking what you did because you will revert to the old. Ah I did x there, get back to y. Thank you Millbrook. I actually looked at some of Tigers swings and saw a few positions that I would like to get closer to. Mainly to try and shorten that backswing and keep my arms more in front of my chest. I may need 1600 reps also to get that wrist set better in order to do so. 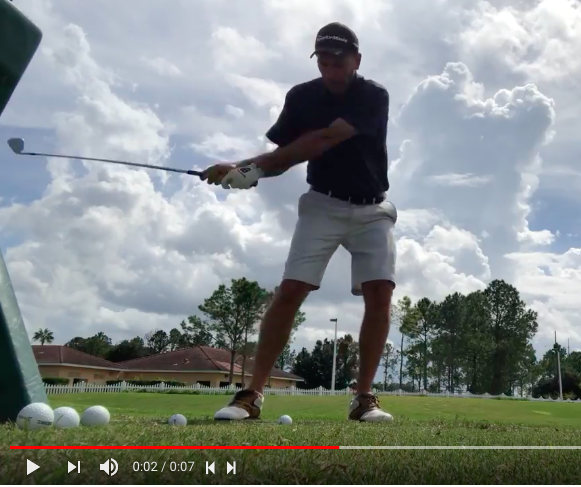 It also looked like I need to get my right side more connected to my right arm towards impact in order to keep the power and spine angle intact. It may help to understand independent vs dependent arm motion. Nearly all of the arm motion you need is a result of your pivot I.e your rib cage turning. You really don’t need to do much independent movement of your arms. I find at least understanding the concept helps allow my brain to execute it. Sounds like trying to make a power shot in hockey, at least in my head. Most power coming from the core and arms just staying connected. I will have to try with some half swings. Thanks for the video Millbrook. Will give that a go and see how it resignates with me. Thanks for the video Millbrook. My last few sessions I have just been concentrating on keeping my posture and shortening the swing. I seem to be able to shorten the swing much easier with irons than the driver. This video may help.